From 27th to 30th July, 2015 "One Future" - The World Orchestra Festival was grandly held in Vienna, Austria. Fabulous Youth Orchestras, including Symphony Orchestra, Wind Orchestra, Marching Orchestra, and Ethnic Orchestra etc from Austria, Singapore, Latvia, and China participated in this Festival. Dr. Heinz Fischer, the Former Federal President of the Republic of Austria, is the Patronage of the World Orchestra Festival. 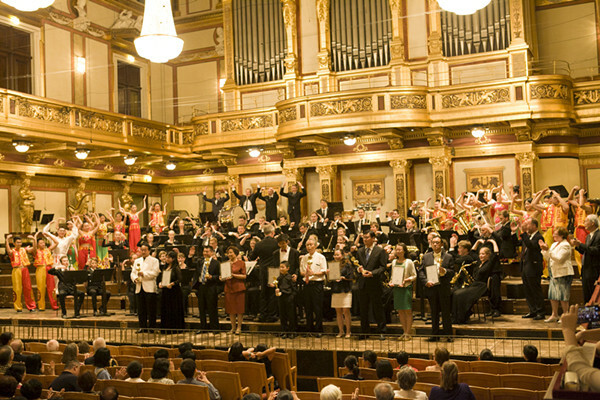 The festival is jointly supported by the World Organization for Promoting Music and Arts Education, Haydn Foundation and Liszt Cultural Center, the Organization for Promoting the Cooperation between China and Germany in Education, Culture and Science, Vienna Municipal Government, Burgenland State Government, Future China Foundation, University of Music and Performing Arts in Vienna, the Vienna Philharmonic Orchestra and Vienna Boys' Choir. The festival is organized by ICT Management GmbH and Beijing Future East Culture & Media Co.,Ltd. The World Orchestra Festival take "One Future" as the theme, and gathers young music lovers around the world to share various art culture, and to create the marvelous future. The festival has been successfully held in Vienna for 3 times consecutively.